“Cars 3,” the latest big-screen installment in the franchise helmed by first-time director Brian Fee (storyboard artist for “Cars” and “Cars 2”), is a lot like the other two films in the series: enjoyable, but nowhere near being Pixar’s best work. Not nearly as fun as 2011’s “Cars 2,” “Cars 3” takes a more mature and heartwarming approach to its story, which focuses on everyone’s favorite racecar coming to terms with the fact that he’s not as young as he used to be. When a new generation of high-tech racers appears on the racecar scene, the once unstoppable Lightning McQueen (voiced by Owen Wilson, “Wedding Crashers”) finds himself literally left in the dust of rookie racer Jackson Storm (voiced by Armie Hammer, “The Lone Ranger”). Following a series of losses to the faster, flashier racecar, Lightning finds himself more determined than ever to prove he’s not ready for retirement just yet. During the final race of the season, Lightning pushes himself to the limits to beat Storm—but ends up crashing and burning on the track. At the start of the next season, everyone assumes that Lightning—like his contemporaries on the track—has left his racing days behind him since he isn’t able to reach the speeds of the newer racecars. However, the veteran racer isn’t about to follow in the tire tracks of his mentor, Doc Hudson, who was forced to retire after enduring his own terrible crash—he’s determined to be the one who decides when he’s raced his final race. Under the watchful eye of a new sponsor, Sterling (voiced by Nathan Fillion, “Castle”), and an eager young race technician, Cruz Ramirez (voiced by Cristela Alonzo, “Cristela”), Lightning begins to train in a state-of-the-art facility for the Florida 500 with more on the line than ever before. For those who’ve followed the “Cars” franchise since its start more than a decade ago, the storyline of “Cars 3” will seem all too relatable. Times have definitely changed since the first movie was released in theaters, especially in regards to technology, so watching Lightning adjust to being Cruz’s “senior” project is sure to generate a few chuckles with older fans of the franchise—particularly when she schedules a nap as part of the legendary racer’s daily workout routine. In fact, most of the humor in “Cars 3” comes from Lightning having to adjust to the fact that he’s growing older and in desperate need of a tune-up instead of “Cars’” usual comic relief, Mater (voiced by Larry the Cable Guy, “Blue Collar TV”), which is a shame. Although the lovable tow truck does appear in the film (including in a post credits scene), he and the rest of the residents of Radiator Springs are used sparingly throughout the movie since Lightning is away for most of the film training for his big comeback. Oddly enough, other than Lightning, the only other main character fans will remember from the previous “Cars” films who plays a major part in “Cars 3” is Doc Hudson (voiced by archival recordings of the late Paul Newman, “Butch Cassidy and the Sundance Kid”), who appears in a series of flashbacks throughout the movie. It’s a nice touch to have Fabulous Hudson Hornet in the film considering the ending of “Cars 3” sees Lightning fulfilling a similar destiny when he finally acknowledges that Cruz is more than just a trainer—she’s a racecar that’s never raced. 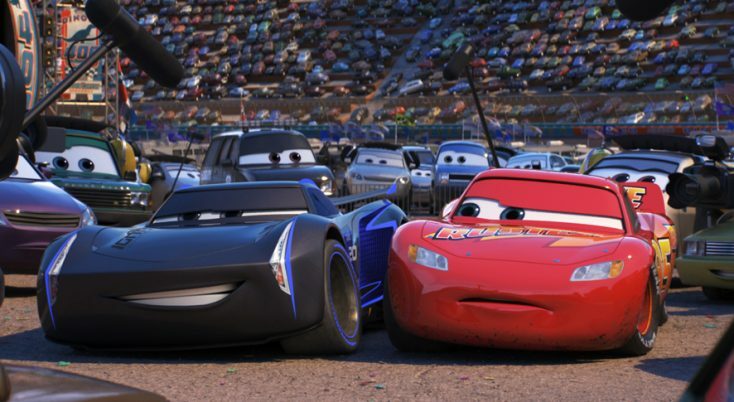 While Lightning’s pass-the-torch story is inspiring, though, “Cars 3” just isn’t as endearing as some of Pixar’s many other masterpieces. That’s not to say it isn’t deserving of the Pixar name, but like its predecessors in the “Cars” franchise, “Cars 3” isn’t the animation studio’s best feature film. Sure, the CGI is as stunning as always—in fact, some of the racetracks actually look like real dirt tracks—and the characters are entertaining, but “Cars 3” doesn’t fire on all cylinders the way it should. Perhaps it’s because the nuts-and-bolts story is a bit too predictable to keep older viewers on the edge of their seats in anticipation of what will happen next or because it isn’t as fast paced or funny as the last “Cars” outing. Whatever it is, “Cars 3” just isn’t as emotionally fulfilling as “Toy Story 3,” which is a shame since the film wraps up Lightning McQueen’s story fairly well. Nevertheless, like “Cars” installments before it, “Cars 3” is still an entertaining enough watch that keeps viewers’ attention throughout its 109-minute runtime. It might not be the most exciting or memorable Pixar film to date, but “Cars 3” never completely runs out of gas, either.